D Sam Klassen (Saskatoon, 2006-10) has signed a one-year contract with the Straubing Tigers (Germany, DEL). Klassen didn’t play this season. Last season, with the Hamburg Freezers (Germany, DEL), he had a goal and six assists in 51 games. 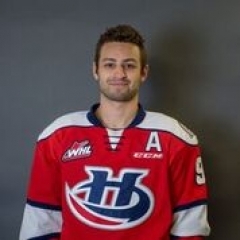 The Lethbridge Hurricanes had F Giorgio Estephan, one of their top forwards, back in their lineup for Game 5 against the visiting Red Deer Rebels on Saturday night, and he contributed a goal and two assists to a 5-3 victory. Estephan missed Games 3 and 4 after taking a high-stick to the face late in the second period of Game 2. . . . The Hurricanes also had D Calen Addison back after a one-game absence. The second-overall selection in the WHL’s 2015 bantam draft, Addison had a fine freshman season, with 33 points, including 24 assists, in 63 games. . . . Addison and Estephan drew the assists on Lethbridge’s second goal last night. The Red Deer Rebels played Game 5 in Lethbridge without F Lane Zablocki, who has been hotter than a firecracker. He was suspended for one game after taking a double minor for checking from behind in Game 5 on Thursday. . . . Zablocki has five goals in the playoffs, which had him tied for the WHL lead with F Patrick Bajkov of the Everett Silvertips when Saturday’s games began. F Brad Morrison was scratched by the Prince George Cougars again on Saturday, so he missed Game 5 against the visiting Portland Winterhawks. Morrison returned from an ankle injury to score the first goal of Game 2, but was hurting in Game 3, so was scratched from Game 4 and again last night. The Cougars and Winterhawks will complete their second bus trip to Portland today where they will play Game 6 on Monday night. It will be interesting to see how many fans show up for this one. The NCAA’s Final Four championship game — featuring Spokane’s Gonzaga Bulldogs and the North Carolina Tar Heels — also is scheduled for Monday. The WHL game is to start at 7 p.m.; the men’s basketball game is to begin at 6 p.m. PT. . . . The Gonzaga roster includes two players from Portland — guards Silas Melson and Nigel Williams-Goss. . . . Williams-Goss actually is from Happy Valley, Ore., which is in the Portland metro area. . . . Of course, it could have been worse. North Carolina eliminated the Oregon Ducks last night. So . . . is a hockey player better off to test positive for mumps or to be found to have mononucleosis? Would he miss more games with the former or the latter? Asking for a friend. A note from Larry Fisher of the Kelowna Daily Courier, as the Rockets prepare to visit Kamloops tonight for Game 6 with the Blazers: “The Rockets have not been impacted by the mumps to date, and are now avoiding the media as a precautionary measure. Some members of the Kelowna media were in contact with Keen earlier in the series.” . . . Jon Keen, the radio voice of the Blazers, has missed two games after showing mumps symptoms and isn’t expected to be at Game 6. D Parker Wotherspoon of the Tri-City Americans left Saturday to join the Bridgeport Sound Tigers, the AHL affiliate of the NHL’s New York Islanders. Wotherspoon, from Surrey, B.C., was a fourth-round selection by the Islanders in the NHL’s 2015 draft. . . . Wotherspoon had 66 points, including 56 assists, in 69 games this season. 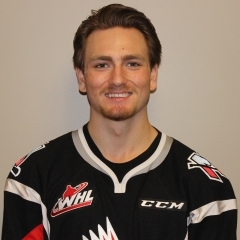 He had one assist as the Americans were swept from the first round by the Seattle Thunderbirds. . . . Wotherspoon, who has signed with the Islanders, will turn 20 on Aug. 24, so is eligible to play one more WHL season. He also could play in the Islanders’ organization. BTW, Lowry also had this to say: “Our guys play extremely hard and are frustrated by (Everett’s) hooking and cross-checking (not being called). And then they go down real easy.” . . . Everett had three PP opportunities to Victoria’s one in Game 5. . . . They’ll play Game 6 in Victoria this afternoon. If you have any interest at all in the concussion lawsuit filed by retired players against the NHL, you will want to read this piece right here by John Vogl of the Buffalo News. Things are getting uglier and nastier by the day, and Vogl has all the details. Warriors are 1-2 in Game 7s. They lost to Calgary in 2010 and Brandon in 03. They beat Cgy in 06. This is the first time they'll be at home. April 1, 2016 the 'Canes lost game 5 to Regina and were eliminated, the boys were determined to make sure it didn't happen 2 years in a row! victory over the Red Deer Rebels. . . . Red Deer holds a 3-2 edge in the series and will play host to Game 6 today. . . . Estephan finished with a goal — he got an empty-netter at 19:34 of the third period — and two assists. . . . Lethbridge F Zak Zborosky (2) snapped a 3-3 tie at 2:28 of the third period. . . . The Hurricanes thought they had scored the game’s first goal on a first-period breakaway by Zborosky. But the goal was negated when it was ruled that the net was off its moorings. . . . F Alec Baer (1) gave Lethbridge a 1-0 lead at 13:58 of the first period. . . . Red Deer tied it when F Michael Spacek (3) counted, on a PP, at 4:20 of the second period. . . . The Hurricanes went back out front at 7:07 when F Zane Franklin (1) scored. . . . Red Deer F Brandon Hagel (5) got that one back, on a PP, at 10:25. . . . The Hurricanes regained the lead 11 seconds later on F Matt Alfaro’s first goal. . . . Hagel sent Red Deer back into another tie with his sixth goal, at 13:49. . . . Zborosky added an assist to his goal. . . . Red Deer got two assists from F Adam Musil. . . . With the teams tied 3-3 heading into the third period, it marked the first time in the series that Red Deer didn’t trail going into the third period. . . . G Stuart Skinner earned the victory with 39 saves, three more than Red Deer’s Riley Lamb. . . . Red Deer was 2-4 on the PP; Lethbridge was 0-3. . . . Announced attendance: 4,562.
lead in the series, with Game 6 scheduled for Monday in Portland. A seventh game, if needed, would be played in Prince George on Wednesday. . . . Hughes scored his first goal of the series just 59 seconds after F Colby McAuley (3) had pulled the Cougars into a 3-3 tie. . . . F Cody Glass (2) provided Portland with some insurance at 17:25. Glass, who turned 18 on Saturday, also had an assist. . . . F Jared Bethune (2) gave the Cougars a 1-0 lead at 1:09 of the first period. . . . 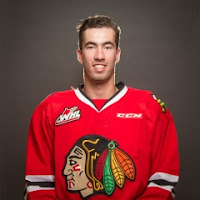 The Winterhawks responded with the next three goals. . . . F Brad Ginnell (1) tied it at 4:28. . . . F Joachim Blichfeld scored the next two goals, his first two of the series, at 15:14 of the first and 2:45 of the third. . . . The Cougars closed to within a goal when F Brogan O’Brien (2) scored at 10:04. . . . D Shane Collins drew two assists for the Cougars. . . . The Winterhawks got a big game from Kehler, who faced 18, 15 and 18 shots by period. . . . G Ty Edmonds stopped 23 for the home side. . . . Portland was 1-2 on the PP; Prince George was 0-2. . . . The Cougars again scratched F Brad Morrison (ankle), while F Tyler Wishowski sat out a one-game suspension that, according to the WHL, was “for actions at Portland” on Thursday. Perhaps he didn’t tip a waitress. . . . Announced attendance: 5,822. Warriors to a 3-2 victory over the Broncos. . . . The Warriors evened the series, 3-3, with Game 7 scheduled for Moose Jaw on Monday. . . . Gregor had 51 points, including 27 goals, in 52 games this season, his second in the WHL. But he was pointless through five games in this series and, along with F Jayden Halbgewachs, took some heavy public criticism from head coach Tim Hunter after Game 4. . . . Halbgewachs was pointless in Game 5. . . . Gregor gave the Warriors a 1-0 lead at 5:24 of the first period. . . . The Broncos tied it when F Ryley Lindgren got his fifth goal of the series at 7:21. . . . Gregor broke the tie at 14:27, and F Justin Almeida (1) upped it to 3-1 at 13:52 of the second period. . . . The Broncos made things interesting when F Tyler Steenbergen got his fifth goal at 13:54 of the third period. . . . F Thomas Foster had two assists for Moose Jaw. . . . G Zach Sawchenko stopped 41 shots for the Warriors, three more than the Broncos’ Jordan Papirny. . . . Swift Current was 0-2 on the PP; Moose Jaw was 0-3. . . . Announced attendance: 2,890.